One can almost hear the sharp chords of Ennio Morriocone’s epic score from The Good, The Bad and the Ugly in this recreation of the movie’s final showdown by Andras Bolvary. In this scene, the movie’s three titular characters ready their wits and six-shooters to decide who walks away with the golden treasure. 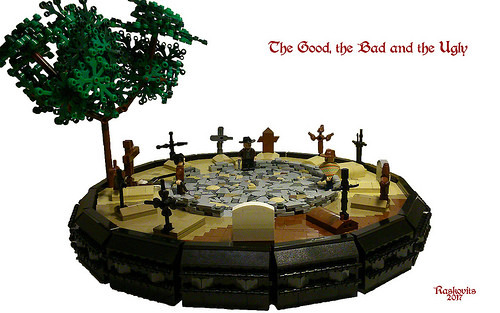 The builder’s decision to build a circular base is a nice choice given the layout of Sad Hill Cemetary. The whole creation is quite faithful to the final scene, with its textured middle ground, varied grave markers and lonely tree. You may even notice a certain stone with a not-so certain description of the gold’s location. Overall, a very enjoyable tribute to one of cinema’s finest films.